The gem of queens and kings is none other than rubies. For thousands of years, the luscious red color of July’s birthstone has signified romance, wealth, and power. When Dorothy from the classic The Wizard of Oz is told that she has had the power all along, it’s no mistake that the power the good witch was speaking of was tied to that fabulous pair of ruby red slippers. In ancient times, rubies were seen as equally perfect for weddings and warriors in battle. In Victorian times, rubies were very popular in acrostic rings — where the first letter in ones name is spelled out. Still prized today, they command the highest per-carat price of all colored stones. July birthday girls Jennifer Lopez, Jacqueline Kennedy, and JK Rowling have all donned rubies. 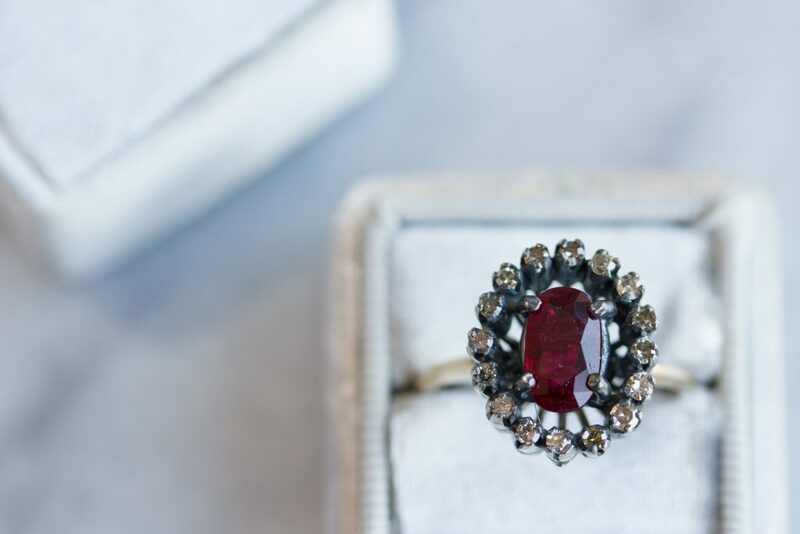 The former first lady had a treasure trove of rubies including a 17.68 carat ruby ring reminiscent of Princess Diana’s sapphire engagement ring. The author of Harry Potter fame has her novels laced with rubies. Not only was Gryffindor’s gem a ruby, her main protagonist was named after a childhood neighbor, Ruby Potter. Courtney Love and Jessica Simpson both have engagement rings with their July birthstone. Ginger Rogers had a pendant depicting her Cancer zodiac sign with an embedded ruby. July birthday girl Sandra Bullock even named her rescue dog Ruby. The royals and the red carpet are wild about rubies. Princess Diana, also born in July, had some spectacular ruby jewelry. Gwyneth Paltrow wore some gorgeous pear-shaped cabochon ruby earrings with a matching ring to last year’s Oscars. The year Natalie Portman won her Oscar, she wore some raspberry ruby tassel earrings. 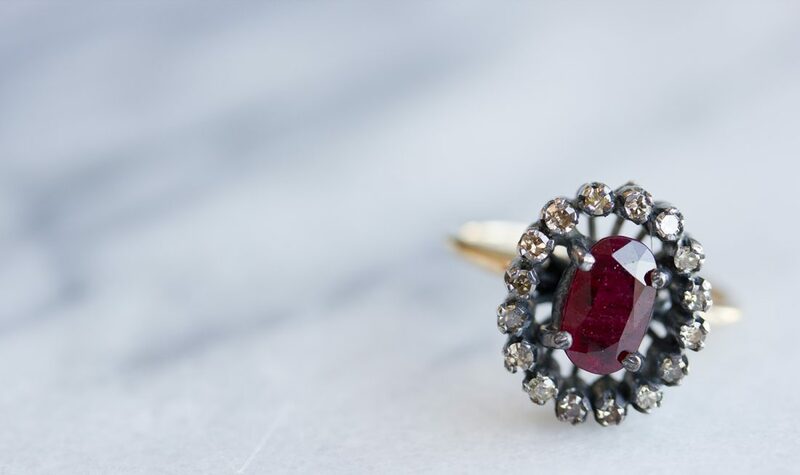 One of the most iconic pieces of ruby jewelry was worn by Madeleine Astor on that night to remember in 1912 when the Titanic sank. Astor was 18 years old and five months pregnant when she boarded the ship of dreams with her multi-millionaire husband for their honeymoon. On the night the ship hit the iceberg, her husband led her to the deck where she wrapped her fur shawl around a third-class child to keep him warm. Before climbing aboard lifeboat number four, she went back for her jewelry including some breathtaking gold and ruby jewelry. As she climbed into the boat with her nurse and maid, her husband stayed behind to perish with 1500 other souls. Once back on American soil, she gave all the rescued jewels away to some lucky girls. Rubies are one of the top four gemstones along with diamonds, emeralds, and sapphires. Second only to diamonds on the hardness scale, rubies are very durable. Both sapphires and rubies are made of the mineral corundum. Chromium is what sets rubies apart from sapphires by giving them that deep rich red color. Because of this, rubies are much rarer than sapphires. While the latter can range from blue to orange, rubies are always red. Rubies are mined all over the world. The largest supplies come from Thailand, but the most prized are from Burma. Rubies mined in Burma typically form in marble which has very low iron content resulting in a more deep intense red color (high iron content can result in a more muddy color). While all natural rubies have inclusions, the good news is that this is how you can tell a natural ruby from a synthetic. As long as the inclusions don’t affect transparence or brilliance, it’s all good. In fact, their presence can help light scatter across facets causing color to distribute more evenly. As far as treatments, almost all rubies are heat-treated to enhance color. Other treatments are also used, but are not as durable. Rubies shine in a variety of shapes such as round, pear, oval, cushion and emerald. They are also often found in unfaceted cabochons and briolette beads. And if you are toying with the idea of a heart-shaped stone, rubies are the one to go for it with. As a ruby increases above one carat, the price goes up significantly. Because of their rarity, rubies were one of the earliest stones to be imitated with rocks or pieces of glass. Unlike thousands of years ago, we now know how to mirror the chemical composition of rubies. By all appearances, synthetic rubies look like real rubies. But because rubies are so expensive, this is one way to afford a larger carat weight. Just for point of reference, a 25.59 carat ruby ring sold in 2015 for $32.4M. One well-known ruby is one of the oldest Crown Jewels of England. The Black Prince’s 170 carat cabochon ruby dates back to the middle of the 14th century. Another is the 100.32 carat Delong Star Ruby that was part of an infamous 1960s burglary where the ransom was a comical $25,000. When it comes to wearing rubies, you can’t go wrong no matter what you decide. Whether it be a ruby pendant with diamond floral motifs, a platinum band with different shaped flush-set rubies, a pair of tear-shaped ruby earrings with pearls, or a cabochon pear and oval ruby and diamond necklace – all eyes will be on you when you enter the room. Besides being July’s birthstone, rubies are also the perfect gem for anniversaries. To find your gem to remember, please drop by or call 619.223.2151.